So I already mentioned how much I loved Starling (and was a little surprised based on how my fellow bloggers felt). I loved it- and it ended with quite the punch. Descendant starts exactly where Starling ended- main characters have been killed (maybe?) and Mason is trapped in Asgard and doesn't even have an idea how much trouble she is in. Although the summary really talks about the book being set in Asgard, that really was only the first half of the book. I don't want to give away spoilers, but I will just say that big things happen in this book and big changes happen. I thought the ending in book one was shocking, but the ending in this book was explosive. I don't have a ton to say about the romance (I covered it in the review for the first book, and I read them both together- so it isn't as if a year went by between books for me). I still find their relationship believable and there was no "oh maybe this won't work" like in most second books. Honestly, there wasn't much time for lovey dovey parts. The book was so fast paced, and so full of action and fighting, I don't think there would have been time to breathe. 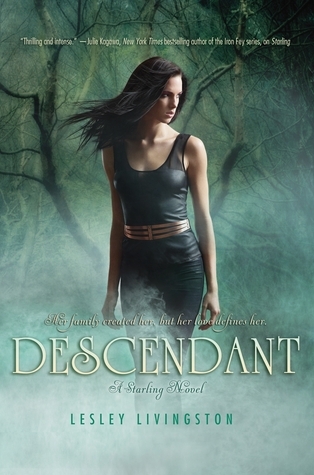 Descendant was an electrifying sequel that kept me on the edge of my seat and my nail bit to the quick. I don't know how I am going to wait an entire year for the conclusion!